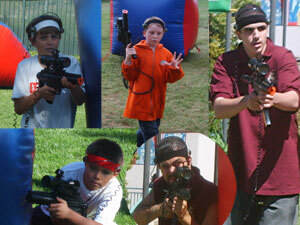 Sensors - The Latest Innovation In Outdoor Laser Tag Equipment Take Advantage Of Our 14 Day Trial Program! What is a sensor? A sensor is the device that picks up the infrared signal from an opponent's gun when you have been "hit". It can also be called a receiver, because it receives the "shot" signal from another player's gun. Indoor laser tag arenas normally use vests to pick up the signal from an opponent's gun. The vest in indoor laser tag is the sensor. Indoor laser tag vests are limited and can only be used indoors because when used outdoors the sun's "rays", which contain infrared "signals", interfere with the vest's primary functions. The sensors on the Ikon-x are designed to filter out the sun's "rays" thus allowing the signal from another gun to register cleanly on an opponent's sensors. We do not place the sensors in or on a vest. Instead the sensors on the Ikon-x are hemispherical shaped devices or domes that are connected to the Ikon-x main unit using a coiled cord. The sensor domes are then placed on your head by way of a hat or using velcro to stick onto a soft cotton headband. One dome is placed in the front of the head and the other is placed in the back. Yes, you "shoot" another player's sensors by way of "headshots". Is it safe for the eyes? Yes. The infrared signal is similar to the signal used on your t.v. remote control. It is entirely safe on the eyes. Why do we place the sensors on the head instead of using a vest? Good question. If you've ever played indoor laser tag then you know there are many restrictions involved. One restriction is that you can't run during a game. Another is you can't crawl on the ground because you might damage the vest. In outdoor laser tag using the Ikon-x we eliminate these restrictions. Since you are not restricted to a small indoor space when you play outdoors, why not run like they do in paintball. And go ahead and crawl on the ground. Since crawling is allowed in outdoor laser tag, if you were to wear a vest the ground would cover your sensor as you're crawling. But with the sensors on the head there's no way the ground can cover your sensor or an opponent's sensor. You and he are always fair game to be "shot". When the sensors are placed on the front and back of the head, the target area around your head is approximately a one foot diameter around the sensors. It's as though you have a "halo" or a "bowl" on your head. So imagine when another player aims at you, he doesn't need a point blank hit onto a sensor dome, all he needs to do is hit within your "halo" or "bowl". This makes for a more fun and competitive experience. Of course the farther away players are from each other, the smaller the "halo" or "bowl" becomes, so each player must be more accurate to hit another player's sensor.